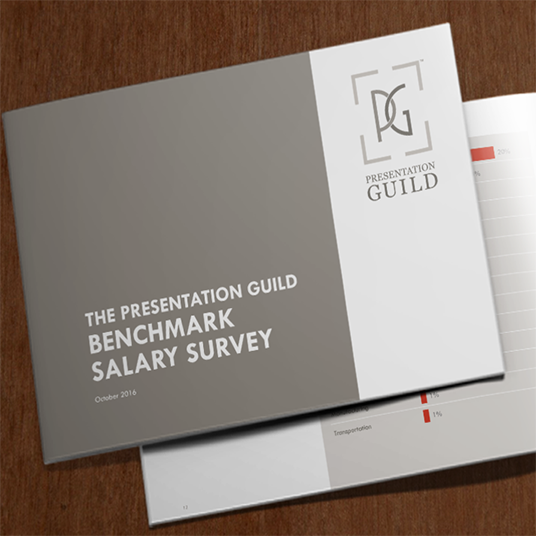 We’re proud to announce the launch of the Presentation Guild Benchmark Salary Survey Report. This report represents the culmination of survey data we collected in August and September of 2016 from presentation professionals across the United States. A $59 value, this survey report is free for Presentation Guild members and to those survey participants who opted to receive the report. The report has something for everyone: a few predictable results, a few eye-openers, a few things that gave us pause to realize that we as a professional field have so very far to go. 1) Already a Guild member? Head to the member hub then click Members Only Resources. You must be logged in to your Guild account to access the report. Thanks to everyone who responded for our calls for participation, and those who will be eagerly reading their copies today. Onward!